Jill Elizabeth has read 0 books toward her goal of 200 books. Hooray for Another Year of Books!! 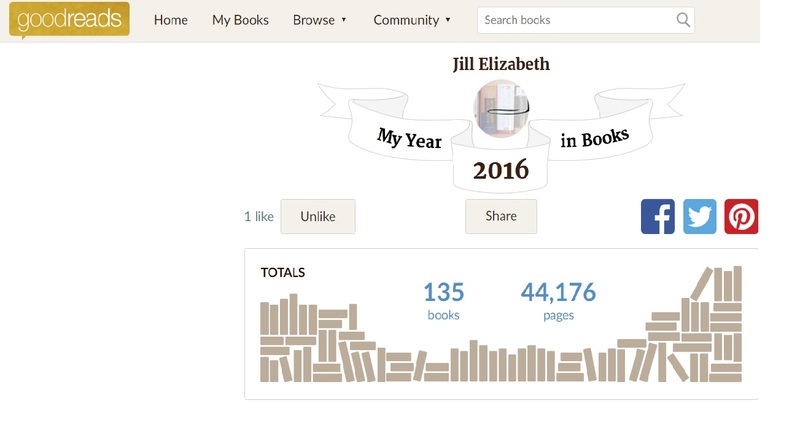 GoodReads is so amazing – I love this year-in-review they provide, and each year it gets more interesting (both visually and statistically)… So here it is, without further ado, the official Jill-Elizabeth 2016 Year in Books! Please note that all content appearing on Jill-Elizabeth.com is copyright protected. As such, no text may be reproduced or distributed, in whole or in part, in any medium without express written or electronic consent from the author. To obtain such consent, please submit your name, the text you would like to reproduce and/or distribute, and the medium in which you would like to reproduce and/or distribute it to JillElizabeth@jill-elizabeth.com. You will be contacted within seventy-two hours regarding your request. This blog contains affiliate links and I will be compensated if you make a purchase after clicking on them. Check out the Penguin First to Read program - firsttoread.com.